Marc-Andre ter Stegen produced a series of stunning saves to earn Barcelona a hard fought 0-0 draw against a spirited Athletic Bilbao, moving Ernesto Valverde's men six points clear at the top of La Liga. Ter Stegen then produced a moment of magic to keep the sides level on 16 minutes, tipping Markel Susaeta's curling left footed effort over the bar with an excellent diving stop. La Blaugrana offered a timely reminder of their attacking threat moments later, however, as ​Luis Suarez was just inches away from connecting with ​Lionel Messi's in-swinging cross. Nonetheless, Bilbao continued to pose a threat of their own, with Raul Garcia's inventive overhead kick bouncing just in front of Ter Stegen, yet the German was able to smother the effort. The question remained whether the hosts would rue not taking one of their numerous chances in a first half in which they were by far the better side, as ​Barcelona came out with more purpose in the second period. Ernesto Valverde's team talk had the desired effect, yet every time the visitors found themselves in the final third, the killer pass deserted them. With Bilbao camped inside their own half, they countered quickly and were inches from taking the lead against the run of play on 65 minutes, but Mikel San Jose's effort from 20 yards flashed just wide. The visitors continued to knock on the door, with both Suarez and substitute Carles Alena both coming close for the La Liga leaders, as time began to run out for the Catalan giants. With eight minutes left to play, it was still the home side who were carving out the best opportunities, with only Inaki Williams knowing how Bilbao weren't in front. 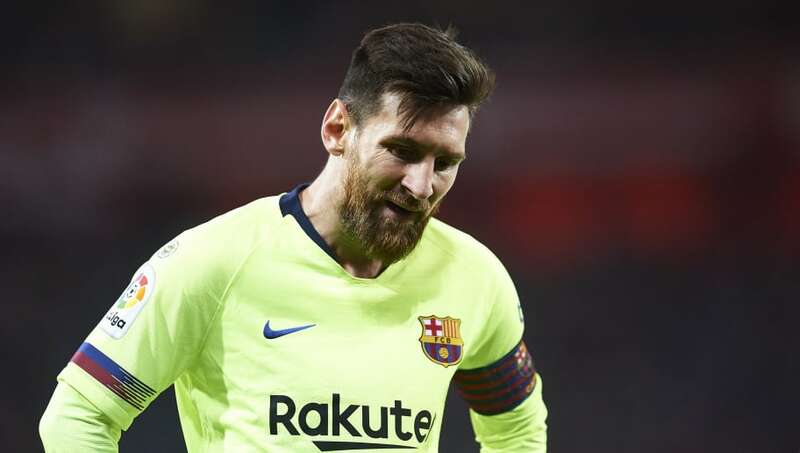 The big question prior to kick off was whether or not Messi would be fit to start the match after only being fit enough for the bench in Barcelona's Copa del Rey draw against Real Madrid. Barcelona were uncharacteristically poor in the first 45 minutes, with Messi's inclusion failing to spark life into Valverde's side as they were second best in every department. They improved drastically after the break, but too many players were average on the day, hardly staking a claim for a start when the league leaders return to Champions League action in just over a week. The German was in inspired form on Sunday night, producing a series of excellent stops to deny a Bilbao side who were left scratching their heads as to how they didn't score. His flying save in the first half to halt Susaeta was outstanding, but was bettered in the second half as he showcased cat-like reflexes to deny Williams from close range. Often overlooked as one of the best keepers in the world, the 26-year-old demonstrated his importance to Valverde's side on numerous occasions. Barcelona were below par on the night, yet had their goalkeeper to thank for keeping them from falling to a shock defeat. Two more stunning saves for Ter Stegen's showreel tonight. Earning his place in the starting lineup in place of the injured Arthur, the Chilean failed in his audition for a regular starting berth with numerous misplaced passes lacking a cutting edge. Since arriving from Bayern Munich last summer, the 31-year-old has struggled to make an impact in Catalonia, often being confined to a role on the bench. He was substituted at the 63rd minute for Carles Alena.